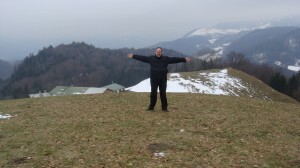 The Sound of Music in Salzburg - The Hills are Alive! I was standing on her mountain, in her meadow, where she did the twirl. Guten Tag, Alles! Our final day here in Salzburg Austria of filming new extra content for 20th Century Fox's upcoming Blu-ray release of THE SOUND OF MUSIC came to a close, and before we finished, we climbed (nearly) ev'ry mountain to come up with new footage, new stories and new insights into the most beloved movie musical of all time. â€¦And it started, this morning, with a visit to the meadow where Julie Andrews did the twirl that made cinematic history, and where she filmed the opening, title song sequence. Sure, the brook (a trough lined with plastic) is long gone, and the birch trees (props, only tall enough to climb higher than the frame) are likewise in prop heaven, and sure, today was bone-shivering raw and cold, the meadow deep in its winter slumber, and a far cry from a resplendent June day, but stillâ€¦I stood on what felt like holy ground to me, and even in the grey of winter I could see the outlines of full summer color immortalized in that unforgettable opening. Our visit to Maria's mountain was only one stop on a very packed final day. We took in a few more shots of old Salzburg such as the Mozart footbridge that Julie and the kids dance across in the montage before "Do Re Mi," set to a piano melody of "My Favorite Things" (that I suddenly realized â€“ voila! â€“ had a Mozartian flavor to it)â€¦And the stunning horse murals at Sigmundplatz (now vonKarajanplatz), shown briefly in the "Confidence" number but also notable to mavens as the site of a rare cut scene (Liesl introducing Rolf to Maria before the "Do Re Mi" sequence). No time for us to toss a ball around this afternoon, however. Back in the van, and a drive past Salzburg over to Mondsee, a small lakeside village (the town's name means "Moon Lake") with a cathedral that stood in for Maria's wedding church. By virtue of having one church that is featured in one scene from one film, Mondsee has become a tourist attraction known the world over. We filmed inside the church, interviewed a few local officials, and then raced back to Salzburg for a few final shots. It was only later that evening, over dinner in a farmhouse deep in the Austrian countryside, that Steven Smith, his ace camera and sound team, and I were able to catch our breaths, have a few platters of Austrian country cooking and realize just how much we saw, filmed and captured in three amazing days. The people we met, the stories they told, the vistas we filmed, were overwhelming. And dinner at the farm house was good. And the apple strudel was, indeed, crisp. Gruss Gott! Greetings from a cold but sunny and glorious Salzburg for Day Two of our Fox Blu-ray filming sessions. It has been crazy fun, running up and down this ancient city, and seeming to climb evâ€™ry mountain along the way. Steven Smith and his dream team from Trailer Park Productions are finding great new angles, and sensational interviews, to give the Fox Blu-ray of THE SOUND OF MUSIC an array of content, the likes of which even diehard SOUND OF MUSIC fans havenâ€™t seen before.